A hidden den of cocktail craftsmanship in Frankfurt, The Parlour is famous for leaving guests spellbound by the presentation and taste of their creations. 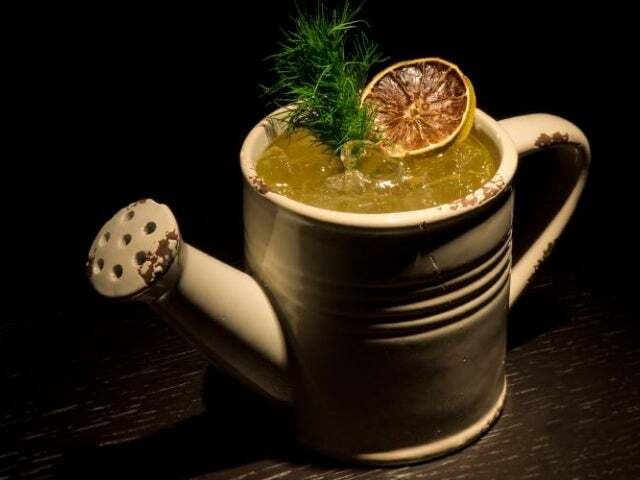 Lying behind an unassuming door on a low-lit street in Frankfurt’s city center is The Parlour, an oasis for those who enjoy expertly crafted cocktails with a garnish of the good life. While The Parlour is certainly an elite cocktail retreat, it still manages to be a welcoming and snug space, and it surrounds you in ‘comfortable’ style from the moment you walk in. Moody lighting, dark wood, and white stone touches are all balanced out by plush brown leather seating, setting a cozy tone for the pouring proceedings. Once your attention is turned towards the cocktail card, The Parlour presents a small but gloriously constructed collection of libations, all beautifully presented and composed of an eclectic assortment of ingredients and garnishes. Many of their cocktails are of a striking hue, as The Parlour often uses herbs, flowers, and homemade touches to tint their drinks to the desired fanciful color shade. The list is always evolving, but recent mixes have included the Babouche – cachaca, vanilla, saffron, fermented pineapple, salt, lemon, beer, and bitter orange – and the Blue Lilac – botanical dark rum, lavender, yuzu, coriander, blueberry, lemon, and tonic. Naturally, all the classics are shaken and poured at The Parlour, but it is the meticulously made creative signature drinks that have made the biggest impression on patrons.